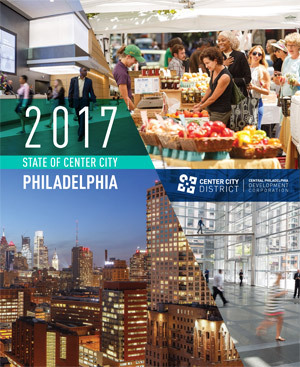 The Central Philadelphia Development Corporation (CPDC)/Center City District (CCD) has released State of Center City, 2017, an in-depth look at the diverse sectors that make Center City Philadelphia the largest employment center in the region. The report documents how Center City provides jobs, education, medical, cultural and retail services for residents from across the city and region. Detailed statistics and survey results are provided about public safety trends, tax policy, and suggested improvements for the future of the city. Greater Center City, Girard Avenue to Tasker Street, river to river, is just 5.7% of the city’s land area, but it generates 32% of all property tax revenue for the City and School District, holds 42% of all jobs, and accounts for at least 43% of the wage tax generated by jobs in Philadelphia. As the largest job center in the region, Center City provides work for 292,746 salaried individuals and another 8,500 self-employed individuals, freelancers and partners. A third of these 300,000 jobs require only an associate degree; a third need no more than a high school diploma. So when SEPTA brings 310,000 passengers into downtown each day, that includes 120,000 workers from Philadelphia neighborhoods north of Girard, south of Tasker and west of the Schuylkill. At least 25% of the employed residents of every neighborhood across the city work downtown. Another 110,170 workers from the suburbs arrive via Regional Rail, highways, and bridges. For those who live and work in Center City, 62% commute without a car, compared to 87% of suburban residents who need cars to get to work. Demographics and sustained job growth for 11 of the last 12 years, the addition of 40,000 jobs – the best winning streak in 40 years – has driven the housing boom. After years of suburban sprawl, Philadelphia accounted for 52% of the region’s new multifamily units in 2015 and 38% of all types of homes. Housing values in Greater Center City have now surpassed levels prior to the Great Recession, with long-term appreciation since 2000 averaging 6% per year. The extraordinary diversity of housing types also allows households to stay in Center City as their needs change over time. At the same time, Greater Center City has 5,200 units of subsidized housing intermixed with market-rate apartments, row-homes and condominium buildings, with another 3,100 units of affordable housing in immediately adjacent neighborhoods. Since 2000, Center City has enjoyed a baby boom, as 33,471 children have been born to Center City parents. Contrary to popular opinion, 76% of children in Greater Center City attend public school, quite comparable to the citywide average of 80%. Bolstered by active “Friends” groups who are supplementing School District resources, enrollment in Greater Center City’s public elementary schools continues to rise, up 5% since 2010, with overcrowding now becoming a challenge in some locations. While education and healthcare employment citywide has grown by 55% since 1990, office towers for two, long-term, homegrown corporate giants are also rising on the skyline. New trends are taking root as well, as coworking office space continues to grow. While it currently comprises only 1% of Center City’s total office inventory, it accounted for 13% of all leasing activity in 2016. Another encouraging trend: 21% of traditional office leases in 2015 and 2016, 1.1 million square feet, went to tenants coming from outside the city. While some relocations have been large, most newcomers into the Philadelphia market leased small or gateway offices to attract young, educated workers who live in Greater Center City. Fifty-nine percent of Greater Center City residents have a bachelor’s degree or higher. This critical mass of talent, combined with the steady stream of graduates from 19 colleges and universities in and around Greater Center City, is exercising a powerful draw for employers. A persistent challenge is job growth. Despite the recent good news, Philadelphia is digging out from decades of severe job loss and we still have 25% fewer jobs than in 1970 and 6% fewer jobs than in 1990, while our suburbs are up 24%. Cities like New York and Boston, which hemorrhaged as many manufacturing jobs, are up 12% and 21%, respectively, over 1970 employment numbers. As a result, 39% of working residents from each Council District are reverse commuting to the suburbs. Without more dynamic growth of transit-accessible jobs in the city, Philadelphia stands little chance of achieving major reductions in unemployment and poverty, and older neighborhoods will continue to see residents moving out to be closer to their jobs. This and other detailed information can be found in this 75-page report, which presents a downtown that has progressed to become desirable as a place to work, do business, enjoy culture, attend school and raise a family. The report also suggests even more that can be accomplished to make the city a better place for everyone.